Halloween is a time of year that I wish we celebrated like they do in America. A friend of mine is heading to Salem for the event and I am inanely jealous. That said, here in the UK some of us do make more of an effort than we used too and if you look hard enough there are events happening where you live. Once you have chosen your outfit, next comes the makeup and Superdrug also have an amazing range from across the brands sold in store and one stand out brand right now is Freedom, the sister brand of Make Up Revolution. Freedom Pro Black Swan Makeup kit is an absolute bargain at £8 and it is also on a 3 for 2 offer. Comprising of a White Foundation, a Black Gel Eyeliner, a White Liquid Eyeliner, a Quad Eyeshadow and a Black Liquid Lipstick. Designed to allow you to create the perfect Black Swan look, you have everything you need in one kit and you can find it here. This is such a fantastic kit and the black liquid lipstick is just stunning. Of course you might feel the need to add to your make up and items such as these, which are all again on a 3 for 2 offer might just capture your attention. Freedom Pro SFX Fake Blood again is on a 3 for 2 offer and is just £2. A Halloween must, this tube of liquid fake blood is designed to give a realistic splash or smear of blood to add some horror to any outfit. Available right here. Freedom Pro SFX Ghost Whitener and as before, it is on a 3 for 2 offer and is priced at £3. An easy to use pure white liquid foundation that blends well to ensure a high coverage pure white finish ideal for the perfect base to the rest of your makeup. Available right here. Superdrug Colour Hairspray Black: Designed to be a spray in and wash out product, this black hairspray gives an instant hit of colour. Available in a wide array of colours such as blue and red, it adds that finishing touch to your look and a bit of fun. Priced at £2.99 it is also on a 3 for 2 deal and available right here. Lash Halloween are a limited edition pair of Halloween eyelashes which add dramatic length and volume. Suitable for those who wear contact lenses, they are also cruelty free and are exclusive to Superdrug. Gosh Giant Pro Eyeliner: From the AW16 Copenhagen range (see my post here) this Giant Pro Eyeliner is an intense black colour and pointed nib make it incredibly easy to apply either a thin or stronger line with accuracy, it is water based so incredibly easy to remove and is easy to hold. Priced at just £6.99 it is brilliant value for money. So now you have found everything you need for Halloween to create that scary look! I used to love getting dressed up for halloween years ago and going out. Was great fun! Superdrug are just an absolute lifesaver aren't they? Can never go wrong! I too wish we celebrated Halloween in the UK like they do in North America. As an expat Canadian living in Scotland it's something I really miss! Amazing colour palatte for this Halloween selection. I'd love to see the end result - are you planning to post again when it's closer to the date? I love Halloween make up - such a great chance to try something new and out there! I love Superdrug in general, but never realised they did kits like the Black Swan one! I was black Swan last Halloween it was fun! I need that black liquid lipstick it would come in handy on Friday- its a Twisted circus theme. You could definitely create some cool Halloween looks inexpensively with these! This is so convenient! Interesting makeup here. Halloween makeup is on my mind. I wish I was going to a Halloween party this year, as there are so many great options here. Such a pity I'm going to be stuck on a train for Halloween otherwise I'd be very tempted to go for this look, if only to greet the trick or treaters! I love super drug. They make occasions like Halloween affordable with their makeup ranges. 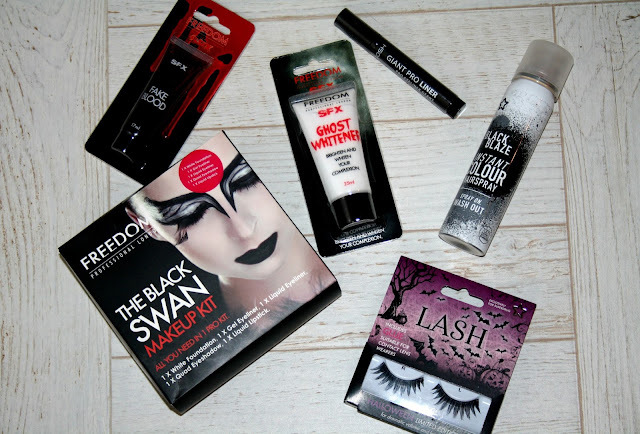 These are all pretty cool pieces for halloween, what a good idea to have a black swan kit!! I actually need to pick up some bits tomorrow so will be on a look out for some of these! I love Halloween too - how great are these make up kits, perfect for creating a fabulous halloween look! I love that Superdrug has affordable Halloween options for makeup this year! Wow they are all from Superdrug! That's really good as I have one near me and need make up for the kids. Thanks so much for that as I wasn't sure where I could get this sort of thing from. This is great! Gave me some inspiration for tomorrow's Halloween party. nice post can you show your complete Halloween look using these stuff.